Sapphires -- September?s birthstone -- sing the primary roles in this rock-opera necklace and earrings set. 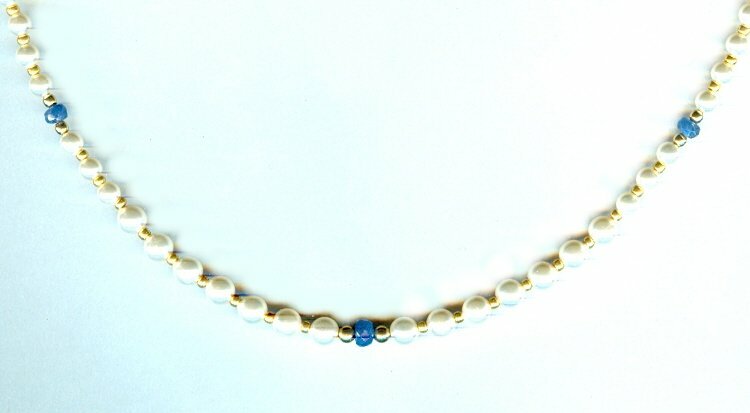 The 19-inch strand features faceted roundel sapphires graduated in size from 3mm to 5mm. The Swarovski crystal pearls that form the back-up singers for the sapphires also range in size from 3mm to 5mm. The walk-on roles are played by 14 kt gold-filled beads, findings (the fish hook clasp is worth noting), and metallic gold glass seed beads. 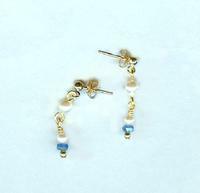 The earrings feature more of the same: 3mm faceted roundel sapphires, 3mm and 4mm Swarovski crystal pearls, and 14 kt gold-fill ball post earring findings. They dangle a bit less than one inch. The set is a great gift for the September-born, or for the lover of sapphires.